Gulf Shores AL house for sale in the beachfront community of Heritage Shores. 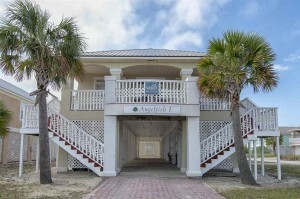 This resort property has been well maintained – raised beach cottage located on the Fort Morgan Peninsula with the Gulf of Mexico is a few steps away. Amenities include 2 swimming pools, tennis & basketball courts, gazebo, outdoor shower, club house and more. This gulf coast residence has hurricane shutters on the south-side windows, ample of storage and covered parking. Climb one of the two staircases and enter the main floor, featuring a spacious living room with wide windows allowing for beautiful natural light and partial Gulf views. The kitchen has beautiful granite counter-tops…plan to visit this home! Gulf Shores is a popular family destination on the Alabama coast with numerous public beaches. Gulf Shores and the Gulf State Park are surrounded by back-bays and rivers, there is a variety of outdoor activities year-round.